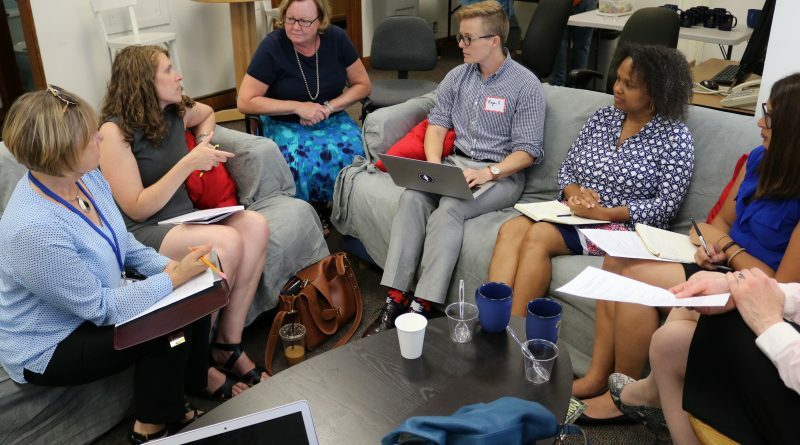 When we started up the Liberal Arts Action Lab in fall 2017, one of our key goals was to invert the regular routine of urban researchers by “flipping the script.” Rather than asking academics what they wanted to study in Hartford, we invited Hartford community partners to define their “knowledge problems” as researchable questions, to help us attract and build teams of interested faculty and students from Capital Community College and Trinity College. But this “matching” exercise raised logistical challenges. Action Lab Director Megan Brown and I both had some experience linking partners’ proposals and students on a small scale, such as inviting a few community guests to orally present their ideas in a “pitch session” with a classroom of students. How could we expand this model to include community organizations from across the city, and faculty and students from two colleges, without requiring them all to meet up in the same room at one time? Our solution relied on a creative mix of lightweight web tools and face-to-face conversations. Both digital and human communication were essential; we could not have done this with only one and not the other. Furthermore, our solution required trust and transparency in our relationships with community partners. Rather than submit a traditional private application form, partners were required to publicly share their one-page proposals on our website, with no guarantee that we would successfully match them up with teams of researchers. 1) Although many of the steps below feature digital tools, remember that people participate in the process when they know that others genuinely care about their potential contributions. Action Lab Director Megan Brown listened to community partners, faculty, and students at information sessions, feedback meetings, and individual conversations. 2) We divide the two-month application matching process into two phases: community partners and faculty/students. 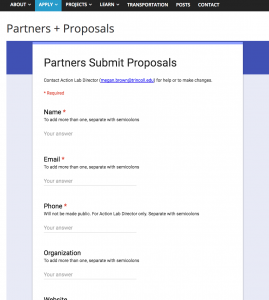 During the first month, on the Apply tab of the Action Lab website, on the Partners + Proposals page, we embed a Google Form for Partner Applications with questions about their organization’s mission, the research question or problem they wanted a team to help them solve, the types of information and research work it would involve, and the types of products they anticipated. The form includes a checkbox for permission to publicly share the partner’s proposal on the Action Lab site. 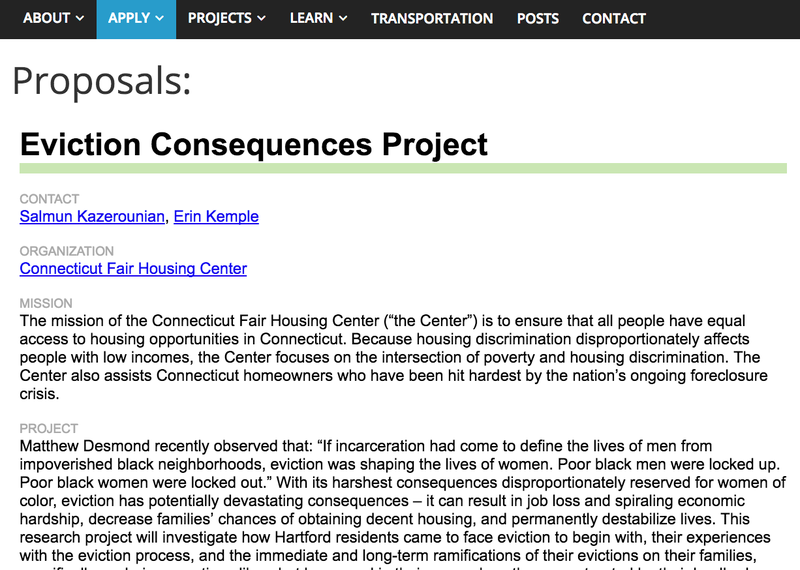 2) When Hartford community partners submit proposals on the Google Form, their results appear in a Google Sheet, where the Action Lab Director reviews content for clarity, adds a short project title, and adds a “Y” into the last column to display it online. 4) After the proposal submission deadline, the Hartford Resident Advisory Board meets to discuss and prioritize proposals. Afterwards, the Action Lab Director resorts the order of the proposals in the Google Sheet so that the highest-rated ones appear at the top of the web page. In our first run of the process in October 2017, the Board reviewed and prioritized 11 proposals. 5) Under the Apply tab, the Faculty page and the Students page contain similar embedded Google Forms, tailored for each group. We ask them to list their preferences for project teams they wish to join, as well as their scheduling info. Below the application form, another iframe shortcode points to the same GitHub repo to display all proposals again. When a faculty member submits a form, their name appears under their preferred project, which is something that students requested. By contrast, students appear as the total number who have expressed interest in each project. Since Fall 2017 is the first time the Action Lab is running our “application matching” process, we’ll learn more as we reach the deadline for faculty and students on October 31st. Several questions remain: Will we have sufficient numbers of applications from faculty and students to match up with the higher-rated partner proposals? And will their schedules line up so that we can reach our target goal of 4-5 students (from Capital Community College and Trinity College combined) plus one faculty fellow per project team? We’ll share more results of our first Action Lab experiment in a future blog post. Updated November 2017: See the results of our first round of application matching. 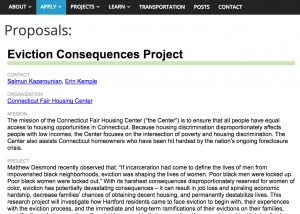 Invitation to 12/10 Action Lab Digital Poster Fair: Food Stories, Home Ownership, Opportunity Youth, and Hartford S.H.E.L.F. 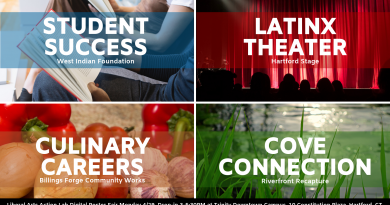 November 30, 2018 Morgan Finn Comments Off on Invitation to 12/10 Action Lab Digital Poster Fair: Food Stories, Home Ownership, Opportunity Youth, and Hartford S.H.E.L.F. Copyright © 2019 Liberal Arts Action Lab. All rights reserved.